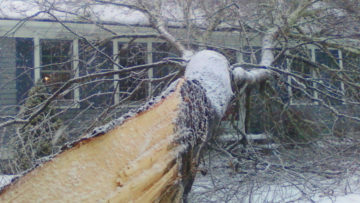 After tornadoes and microburst storms, a major cause of property damage and power outages is, of course tree failure. Falling tree limbs and trees uprooted from high winds or an ice storm can put your property and personal safety a in potential jeopardy. After a storm, we often receive many calls here in Kansas for tree removal work. In all of the fallen and broken trees that we have safely removed, we have noticed that, most often, it’s the trees that already had some sort of defect or structural weakness that fail. While any tree can potentially fail, a defective tree will fail much sooner than a healthy tree. These defects that predispose a tree to failure can usually be visually detected and identified before hand. Some tree defects can be corrected through pruning and some defects may warrant having the tree removed. In tree risk assessment, there are many factors an arborist considers in predicting the future out come of a tree. There are however some basic leading factors that anyone can learn to recognize. Most often deadwood can be pruned out of a tree to make it safe. In some cases, however there may be significant enough dieback in a tree to indicate the declining health and stability of the tree. A broken branch or top is lodged in a tree. A branch is dead and of sufficient size to cause injury (this will vary with height and size of branch). If you see any cracks in tree limbs or in the main stem of your tree, this could be a serious hazard. 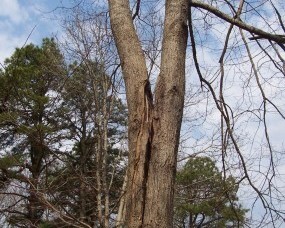 Cracked limbs may be pruned out while cracked trunks will most likely require a complete tree removal. A crack extends deeply into, or completely through the stem. Two or more cracks occur in the same general area of the stem. A crack is in contact with another defect. A branch of sufficient size to cause injury is cracked. Keep in mind that a visually detectable crack indicates that the tree is already failing to some degree! Weak branch unions occur when a branch is not securely attached to the rest of the tree. This can occur when there are many limbs growing very close to one another as in this picture. There can also be a weak branch union in the case of a co-dominant stem. In other words two main stems of relatively the same size are growing up, competing for dominance. When tree branches grow this close to one another bark grows in between the two limbs where they connect. 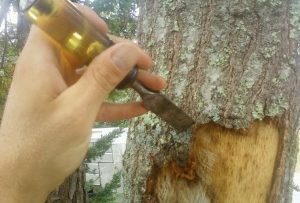 This ingrown bark does not have the same strength as wood and is prone to fail when an added load is applied such as wind or ice. Weak branch union can often be supported by a supplemental support installed in the tree’s canopy. Tree cabling and bracing, if installed properly, can be very effective in mitigating the hazards posed by Co-dominant stems or weal branch unions. A weak branch union occurs on the main stem. A weak branch union is cracked. A weak branch union is associated with a crack, cavity, or other defect. Tree cavities are caused by wounding or by disease. Depending on how deep into the stem the decay has advanced, tree cavities can become a cause for tree failure. A cavity or multiple cankers affect more than half of the tree’s circumference. A cavity is physically connected to a crack, weak branch union, or other defect. Decaying trees are prone to failure depending on how advanced the decay is. Evidence of decay can bee loose bark, sunken cavities along stem, fruiting fugal bodies such as mushrooms, conks, and brackets growing on root flares, stems, or branches. If you see any of these symptoms in your tree you should contact a professional arborist to help you assess the health and condition of your tree. Advanced decay is associated with cracks, weak branch unions, or other defects. A branch of sufficient size to cause injury is decayed. The thickness of sound wood is less than 1″ for every 6″ of diameter at any point on the stem. Fruiting fungal bodies on the root flare of a tree indicates that there is decay setting into the roots. It is difficult to determine with out a root collar excavation, how extensive the decay is. Any signs of root decay should be looked into right away. to assess the safety of your tree. Insects such as carpenter ants and wood boring insects can cause physical weakening of a trees wood. This weakening can often lead to tree failure if unaddressed. In this picture, Pine Bark beetles, a common pest, have riddled the trunk with holes. Pine trees infected with these Pine beetles will often die completely within 2-3 years. Again, a proper tree risk assessment requires thorough investigation of many factors. But looking for these basic tree defects can give you a good initial idea of the health and stability of your trees. Trees, by their nature and design are quite capable of withstanding, even very strong storms and winds. But trees do fail, and have an even greater likely hood of failure when weakened by one or more of these defects.